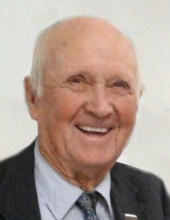 Robert James Scearce, 98, of Danville, Va., passed away on Monday, November 19, 2018, at his residence. He was born August 15, 1920, in Pittsylvania County, Va. to the late Gladys Snead Scearce and the late John Scearce. He was preceded in death by his loving wife, Inez Guthrie Scearce. Mr. Scearce proudly served his country with the US Army in WWII. He was a member of Mt. Hermon Baptist Church. Mr. Scearce is survived by his daughter Debbie Shumate and husband, Bill of Danville; his sons, Randy Scearce and wife, Beth of Danville, and Doug Scearce and wife, Joyce of Danville; as well as five grandchildren and ten great-grandchildren. In addition to his wife and parents, Mr. Scearce was predeceased by his sisters, Betty Conley, Lizzie Haynes, and Barbara Saunders; his brothers, Herbert Scearce and Woodrow Scearce; his half-brother, Hollis “Doc” Scearce; as well as one grandchild. Funeral services will be held 2 p.m. Friday, November 23, 2018, at Norris Mt. Hermon Chapel, with Rev. Mike Hearp officiating. Interment will follow at Highland Burial Park. The family will receive friends from 12:30 p.m. to 1:30 p.m. Friday, Nov. 23 at the funeral home prior to the service. Norris Funeral Services, Inc. & Crematory, Mt. Hermon Chapel, 3995 Franklin Tpke., Danville, Va. is respectfully serving the Scearce family. Online condolences may be made at www.norrisfuneral.com. To send flowers or a remembrance gift to the family of Robert James Scearce, please visit our Tribute Store. "Email Address" would like to share the life celebration of Robert James Scearce. Click on the "link" to go to share a favorite memory or leave a condolence message for the family.